Any digital camera image sensor is made up of these components. Color filters: Give the color-blind CCD or CMOS sensor chip the ability to respond to various colors of light. Microlenses: These tiny lenses focus the incoming light onto the photosensitive area in each photosite. 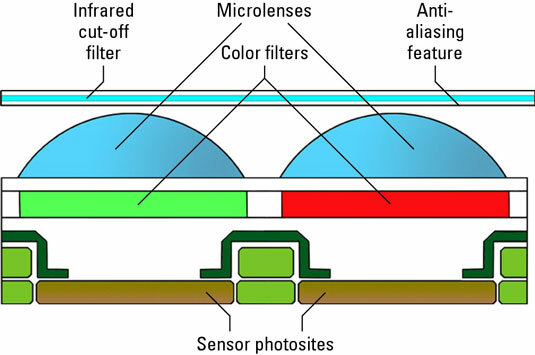 A protective transparent layer: This layer contains two filters, including an anti-aliasing filter that smoothes out the incoming light signal by eliminating certain frequencies of light before they can clash and an infrared cutoff filter that removes most of the infrared light from the illumination reaching the sensor (because “IR contamination” can affect image quality and produce off-color colors).